Product prices and availability are accurate as of 2019-01-13 13:01:14 EST and are subject to change. Any price and availability information displayed on http://www.amazon.com/ at the time of purchase will apply to the purchase of this product. Dust separation at its finest! The CV1800 dust collection system is powerful and efficient- ideal for woodworkers, small businesses or other entities in need of fine dust collection. Based on the Bill Pentz cyclone design, the powerful 5HP 220v Leeson single phase motor coupled with our 15" backward-inclined blower generates 1,442 cfm. Intake is sized to receive 6" sewer and drain PVC. 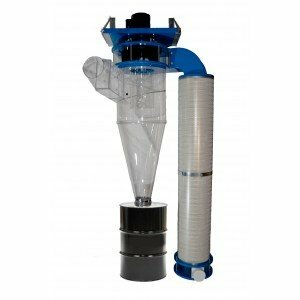 Two Wynn NANO filters eliminate 99.999% of the dust down to 0.5 micron, returning the cleaned air right back to your shop! Assembly required. Brackets, collection bin and Filter Clean Out Box sold separately. System includes 220 v, 5HP Leeson single phase motor. Optional remote start is available for purchase through Amazon - http://www.amazon.com/dp/B071DG38PM. Clear Vue Cyclones was founded in 2004 as a family owned business in South Carolina. Our commitment is to provide state of the art dust collection systems, wholly manufactured in the USA. Based on the Bill Pentz design Generates 1,442 cfm - 6" inlet sized for S&D PVC 220 v, 5HP Leeson single phase motor NANO filters eliminate 99.999% of the dust down to 0.5 micron Requires 96" installation height. Alternate installations available for lower ceiling heights.